This 375-car parking deck serves the DePaul community, as well as customers of the Dominick's "Fresh Store" Supermarket in the adjacent building. 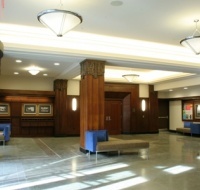 This existing manufacturing building was renovated and restored into academic space, commercial office space and the Lincoln Park branch of the Chicago Public Library. This new structure provides 520 parking spaces. Similar to DePaul's other parking facilities, the structure is very sensitive to aesthetic considerations, preserving the unique charm and character of its Lincoln Park neighborhood surroundings.